Coventina: is a water goddess who had a shrine dedicated to her at a well at Bricolita Fort on Hadrian’s Wall. Other sites for her worship have been identified in Gaul. The titles ‘Augusta’ and ‘Sancta’ appear on dedications to her, suggesting a high status as these were usually reserved for deities worshipped in Rome. Coventina is a water goddess. A large number of votive stones, altars and other objects inscribed with dedications to her were found at a well in the Bricolita Fort (now Carrawburgh) on Hadrian’s Wall. It is clear from these, together with the extensive evidence of other offerings, that she was venerated at the well around which a shrine was constructed. On one of the dedicatory thuribles found in the well she is given the title ‘Augusta’ and on one of the altar stones she is referred to as ‘Sancta’. It is very rare for deities other than those worshipped in Rome itself to be given these titles. Since the discovery of the shrine in 1876 other sites in Gaul and elsewhere have been identified with dedications to her. There is no suggestion that the water in the well had any specific healing properties and Coventina can therefore be taken to represent divine water itself rather than the beneficial quality of a particular spring. The well was sealed at some time during the later Roman period and filled with the dedicatory objects , probably including items from the nearby Nymphaeum. It remained undisturbed until it was excavated in the nineteenth century. All of the items taken from the well are now in the nearby museum at Chesters Fort. 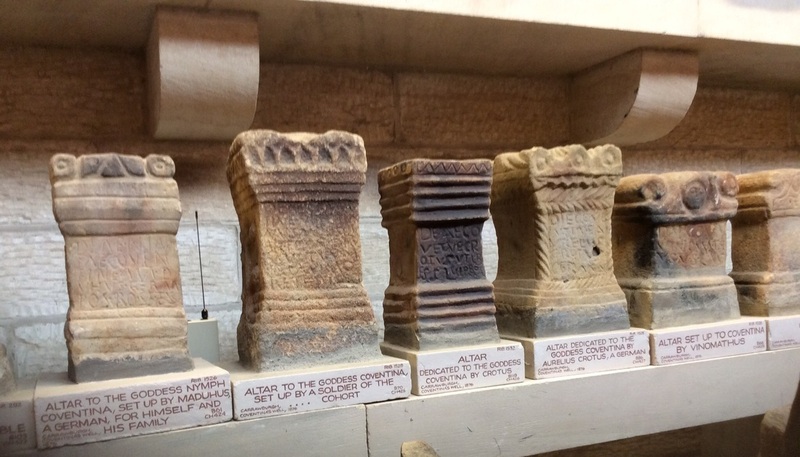 Altar stones in Chesters Museum, UK.